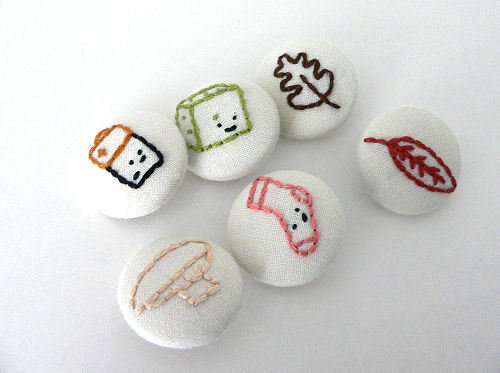 I recently received a ridiculously cute set of embroidered buttons from Mollie at Wild Olive. We were partners in the Feeling Stitchy Embroidered Button Swap, and I couldn’t have received a better partner. Seriously, how adorable are these little guys? I love them all, but I definitely think the little sock and the cube are my favorites. I don’t know if I’ll ever be able to use them, because I like thinking about how I could use them so much. I don’t know if I can give them up. I guess I’ll have to wait until the perfect project comes along. Fortunately, Mollie also has an Etsy shop, so if I can’t part with this cuteness, I can always get some more. Thanks, Mollie! You are so talented! 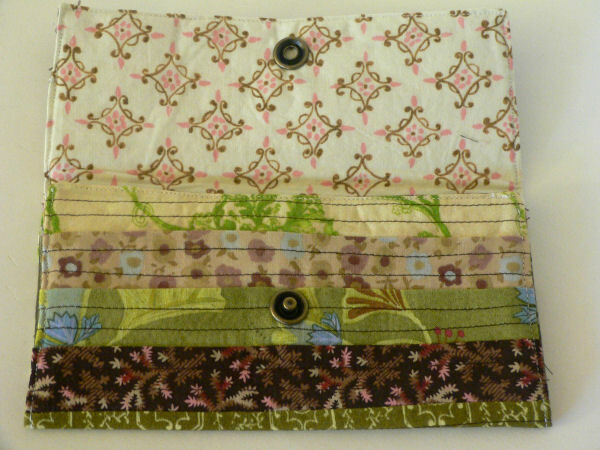 I put together this pencil roll based on the instructions in Last Minute Patchwork + Qulited Gifts . 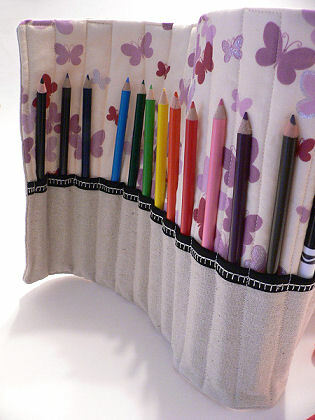 I deviated a little bit from the instructions for the sake of saving a little time and creating something just right for my swap partner, but not so much that I didn’t get a good sense of what it’s like to make this particular pencil roll. It went together quickly and easily, and I’m certain I will be making another one in the future. 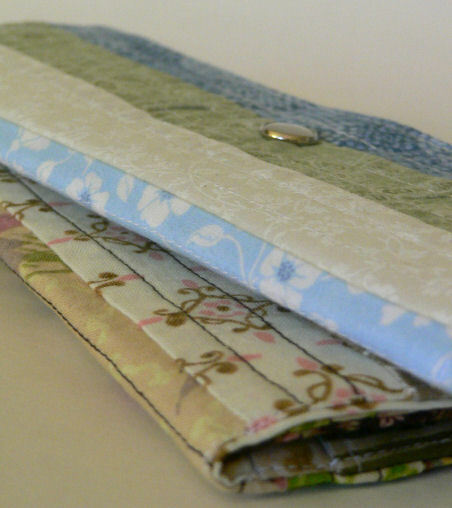 The pattern calls for a layer of flannel inside the pencil roll, to give it a bit of stability and structure. I didn’t have any flannel on hand, so I used some quilt batting. It worked, but created a slightly bulkier roll that way. I’ll be sure to use flannel on the next one. This is the first thing I’ve made from Last Minute Patchwork + Qulited Gifts , even though I’ve had the book since Christmas. The instructions were wonderfully clear and easy to follow. I don’t think I’ll wait another 7 months before I try another one! I can’t knit. I once knew how to crochet, but I forgot, and I haven’t had the patience (or more importantly, the dexterity) to learn again. 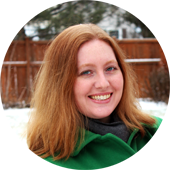 I satisfy my desire to knit and crochet by drooling over the beautiful scarves, sweaters, and wrist warmers I see on Etsy and arranging trades with people who know how to knit. A good friend of mine has agreed to knit me a scarf in exchange for a tote bag. Last month, I serendipitously ended up in a trade with Knittinchick: a pair of hand knit baby Uggs in exchange for a wristlet. I mentioned before that I don’t have a baby, but I expect to have one some day and she or he will need stylish footwear. A bonus is that me suddenly having a pair of baby booties around has really freaked out SciFi man, who isn’t so sure about this whole baby thing just yet. 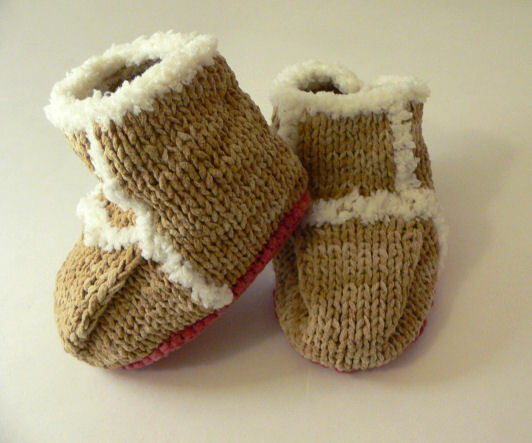 Knittinchick’s baby Uggs arrived in the mail yesterday and they are just adorable. Tan, with little red bottoms! Someday, some baby is going to look very cute. Now, I’ve got to get that wristlet in the mail! Do you like to make ATCs? Do you like free stuff? Chia’s House of Stir Fry is having a Red Hot ATC Swap. If you like to trade ATCs, this would be a great swap in which to do it, because I know that Chia is a very talented artist. 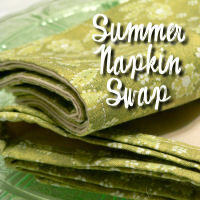 You better hurry to sign up, though, because the swap and giveaway is only for the first 7 people! 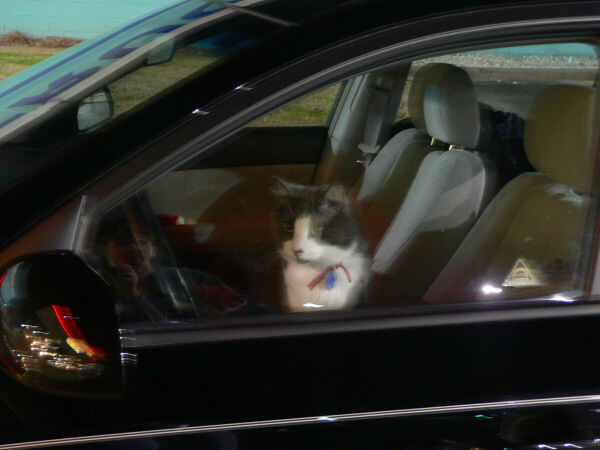 We recently decided that we would make the long drive home for the holidays again this year. By long, we’re talking about over 1,500 miles. It’s a long two-day trip. Since I have a tendency to either a) put off making a CD for us to listen to until the last minute (which means it may not happen at all, or it won’t be a very good CD) or b) choose the same old songs for new CDs, I thought it might be a good idea to put our road trip music selection into more capable, or at least fresh, hands. I’m also planning ahead! Since I imagine we aren’t the only ones who’ll be making a long trek home this winter, I set up a swap on Swap-Bot for road trip mixes. Since Swap-Bot is free, and CDs are cheap, you should join. Especially if you’re going to be driving somewhere soon. After my fun trade with KeelyB, I did a little poking around on the internet to see if I can find another way to do some trading. I found Swap-Bot. Swap-Bot is a site that makes it easy to set up swaps for all sorts of things–it matches participants for you, helps you track when items are sent and received, lets you share photos of the things that have been swapped, and most importantly, allows swappers rate each other, so that you can have some assurance that you aren’t trading with an unsavory swapper. There’s still risk involved, but it’s comforting to see that someone has managed to send their swaps out and that the recipients have been pleased with them. Do you swap or trade? If not through swap-bot, then how?